This memory is used by some people as an emotional map to move through life in search of that person with the feeling that we already know them. 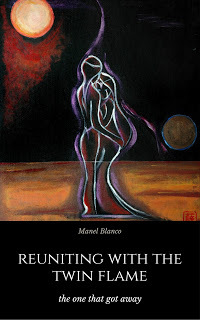 In 'Calling In The One: In The Quest Of Love', I wrote the simplicity and description of such process. Unfortunately, most people give up on this memory, the idea and the feeling to settle for someone else and a safe life. A safe life is what we have been taught to believe in, even though there is not safety in safe. However, renouncing to the memory does not remove the feeling or the hope of the twin flame, leading to a deep sense of dissatisfaction. The end of friendship takes over, along with a feeling of desolation and that we will never find what we want or another person who can make us feel better than they did. This feeling could be with us for years to come, turning our emotional world into a desert in which we want one person only. This might be the person who never wants to see us again, our twin flame, and this definitely won't happend for as long as we remain in our current state of consciousness. However wonderful the time with a twin flame has been, what made us feel so wonderful and liberated was not entirely the physical contact, but the fact that we expressed our true feelings and emotions to someone else. There is, somehow, a natural reaction to closing down to others and the world, as if preserving all our beauty for the return of the twin flame. If there is not a true expression of the self, we recede into a state of seclusion in which the soul feels incarcerated. Let's regain our freedom by continuing to express ourselves in ways the make us feel alive, as if that person was still with us. It is a way to honour them, the self and all the unexpressed love we hold within. Saving love for a special occasion will prevent us from expressing it when it matters. The soul cannot be damaged by anyone. This is nothing but a human feeling created by social conditioning. We don't owe our lives to one person, but to ourselves and the universe, including everyone else in the world. Find your true expression through creativity and love. This is what makes you attractive and what gives you the opportunity to find yourself. Closing to the world, also stops all chances we might have to find true love with another person. This new period without the twin flame is ideal to find self-love, so as to finally realise that the friend we are looking for is the self. Let's begin to treat ourselves as such and allow the soul to express itself freely. You already know what you do to stop the soul from being free. Let's not allow the temporary feeling of immediate gratification to govern our lives. To be our own best friend, we must act like one. And the only way we can do this is with love and self-love. Only when we truly love ourselves, we can love others and attract that person we really want to be with. It might not be who we thought it might be, but to love, this is a small detail of no importance. If love does not come to us, it is only because we are not open to love. It is time to let go of the idea of how it should be and to allow what it is. There will be a time for reunion. We just have to trust on divine timing. Until then, let's make the most of it.